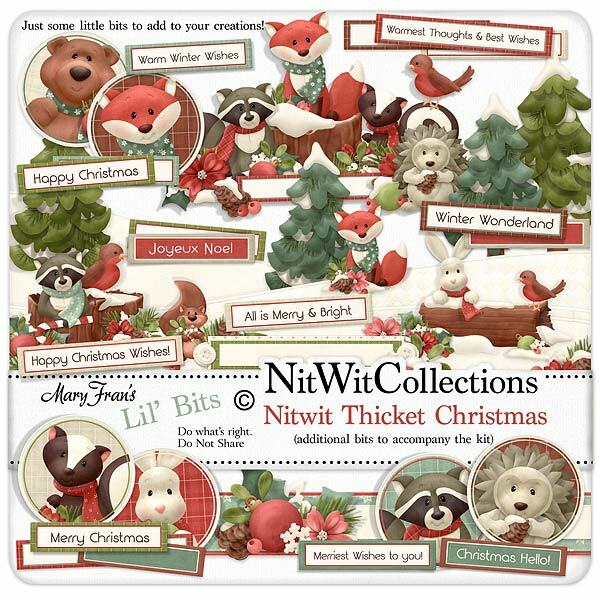 Lil' Bits "Nitwit Thicket Christmas" digital element pack adds even more delightful poses of our Christmas clan along with many wordstrips with sayings that we thought you'd want. This element pack is a do not miss as they are so cute when placed in these ready made scenes and individual label circles! Don't miss out on these digital elements as they are not included in the FQB "Nitwit Thicket Christmas" Collection so don't pass these by! 1 Border strip - "Merry Christmas to You"
1 Label circle of hedgehog...his hairstyle really fills this circle!! 1 Label circle of the fox....now why do they call them sly?? 1 Label circle of our bear...the sweet huggable bear! 1 Topper of a beautiful snowy Christmas scene in the forest. Wouldn't you like to live here? !